Nielsen published a new State of the Media report with a focus on black and Hispanic audiences. Those demographics account for nearly 75 million weekly radio consumers. 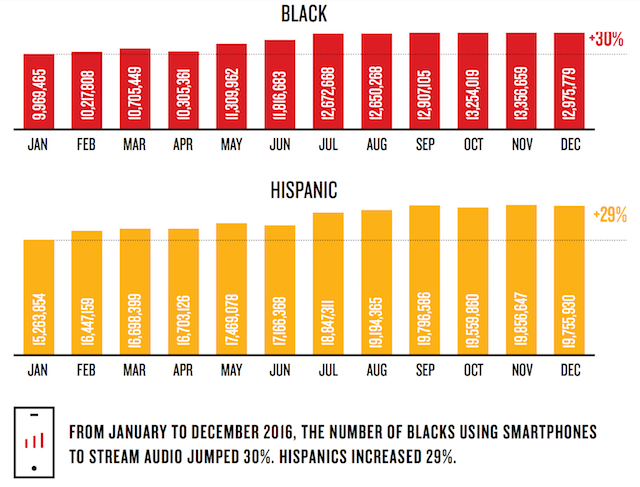 Audio consumption is increasing for blacks and Hispanics, especially on mobile and smartphones. Radio listenership among blacks has risen from 30.8 million in 2013 to 32.3 million in 2017. That equates to a 13.5% share of the total radio audience, and 93% of all black Americans are reached by radio weekly. The black audience using smartphones for audio rose 30% over the course of 2016 to nearly 13 million people. Hispanics’ radio audience increased from 39.5 million in 2013 to 42.4 million in 2017, reaching a 17% share of the total national audience. Radio has a weekly reach of 98% among this group. The number of Hispanics using smartphones for audio reached about 19.76 million, up 29% over the year.